Attorney Craig Tractenberg, a partner at Philadelphia-based Fox Rothschild LLP, is the subject of a complaint submitted to The Disciplinary Board of the Supreme Court of Pennsylvania. 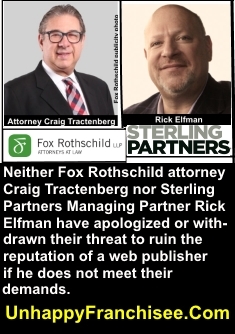 The complaint alleges that Tractenberg threatened to damage the reputation of a web publisher by releasing embarrassing financial and (false) marital records unless unflattering content was deleted about Tractenberg’s clients, Sterling Partners’ School of Rock franchise company. The complaint alleges that the records Tractenberg was threatening to release may not even have been related to the web publisher – but were the records of an unrelated third party with the same name. In the 10 years that he has published UnhappyFranchisee.Com, a website that allows franchise owners and employees of franchise companies to anonymously share insider insights and complaints, web publisher Sean Kelly’s received many threats from franchise companies and their lawyers who want their dirty laundry taken off the line. “I’ve been bullied, threatened, hacked, defamed, sued (twice) and was even the target of anti-semitic hate speech, which is unusual for someone named Sean Patrick Kelly,” says Kelly, the main writer, publisher and defender of UnhappyFranchisee.Com. According to Kelly, a prominent franchise attorney named Craig Tractenberg, who recently left Nixon Peabody to join Fox Rothschild LLP as partner, has added to the unsuccessful threat list. “Craig Tractenberg demanded that I remove complaints posted by his client’s franchisees. If I didn’t comply, he said he’d release a bunch of damaging information he’d dug up about me, including my divorce records,” said Kelly. After the threatening call, which also included the threat of a massive lawsuit, Kelly says he double-checked with his wife. Kelly has a 10-year old bankruptcy which was posted on the Internet years ago by another franchisor bully. Tractenberg threatened to release bankruptcy records which have already been posted. Kelly actually believes that Tractenburg and Sterling Partner (private equity owners of the School of Rock and Sylvan Learning franchises) may have based their extortion plan on records they discovered on the wrong Sean Kelly. Kelly’s Complaint Against Tractenberg is a Serious Matter. Jokes aside, Kelly is deadly serious when it comes to defending his right as a web publisher and defending his commenters’ rights to speak their minds freely and anonymously. Sean Kelly has filed a 7-page complaint to The Disciplinary Board of the Supreme Court of Pennsylvania, the body that governs the conduct of all 60,000 attorneys in Pennsylvania. If the Board determines that Tractenberg violated his ethical code as a licensed, PA attorney, he could face public or private reprimands, temporary suspension of his license to practice law, or even permanent disbarment. Kelly alleges that Tractenberg violated his ethical responsibilities by attacking an unrepresented 3rd party with extortion-like threats, and with numerous statements of fact Tractenburg knew were false. That will be one of the questions hopefully answered by the PA Disciplinary Committee when it investigates attorney Craig Tractenberg. This is not the first time Tractenberg threatened Kelly and UnhappyFranchisee.com. Back in 2014, Tractenberg claimed Kelly was defaming his client Nick Papanier Sr. of Primohoagies, who was convicted of tax evasion and sent to prison. ARE YOU FAMILIAR WITH CRAIG TRACTENBERG, FOX ROTHSCHILD, STERLING PARTNERS, RICK ELFMAN, SCHOOL OF ROCK CEO DZANA HOMAN, & THE SCHOOL OF ROCK FRANCHISE OPPORTUNITY? SHARE A COMMENT BELOW. ← Is STERLING PARTNERS Funding a Craig Tractenberg Vendetta?